Test Data: BF- .85 LE 10.7 WPDA- 1.68 at 360 lbs. 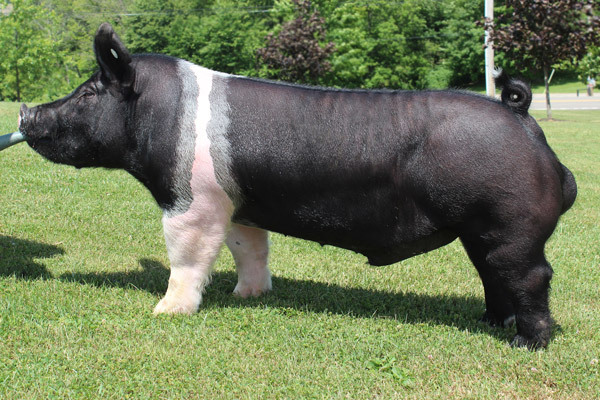 The Program was the Must Own Hampshire Boar from the World Pork Expo! He's the result of the long term vision and passion of a true breeding program. Genetically, he's an outcross to a majority of the popular lines in the Hampshire breed. The Program is a bigger outlined and incredibly rugged Hampshire boar. He has big feet and wide spread, thick toes with big dewclaws that sit on the corners of his feet. His bones are extremely big and flat and his joints are clean. His skull is stout with great width between his eyes and ears and good length to his face and a stout jaw. He has an extremely big shoulder blade and forearm, that angles and slopes very well. His rib cage is deep and bold with great curvature. The Program has an extremely long hip with a great set to his hock and rear foot. His chest is wide and his knees are square. He has an enormous top, a 10.7 Loin Eye @ the show, with awesome shape and a very big hip with muscle that is long and ties deep. If you liked him at the WPX, you will love him now! He has continued to get better everyday! If you're serious about making better Hampshires, you need to get with THE PROGRAM! !